Our keyseaters can be profitably applied to medium and small series production as well as to single piece prouction. 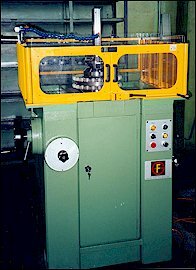 They can cut keyways and splines with any profile in round and conical bores as well as conical keyways much quicker than on conventional machines. (http://www.cmz.it) which has been designing snd manufacturing programmable controllers for industrial automation since 1976. In addition to producing standard systems, CMZ is certified as a Research Laboratory; it is organized to develop dedicated projects and software packages specific for the motion of the machine. To our machines are using a Fct 200 control, capable of managing potentially up to 8 axes of work environment and operating in IEC61131. For our machines you can use touch-screen terminals from 3.5 "to 15"
designed to interface efficiently with CMZ controllers, and they can communicate with the most common PLC of the market. The organization of an international distribution network, guarantees a before and after sales service not only in Italy but also abroad; CMZ has a large stock of spare parts.